Gnocchi. Italian dumplings made simply with potato, flour and egg; quick and rather more exciting than the penne you were about to reach for. But how to make gnocchi? Don’t worry, it’s about as simple as Italian food gets. 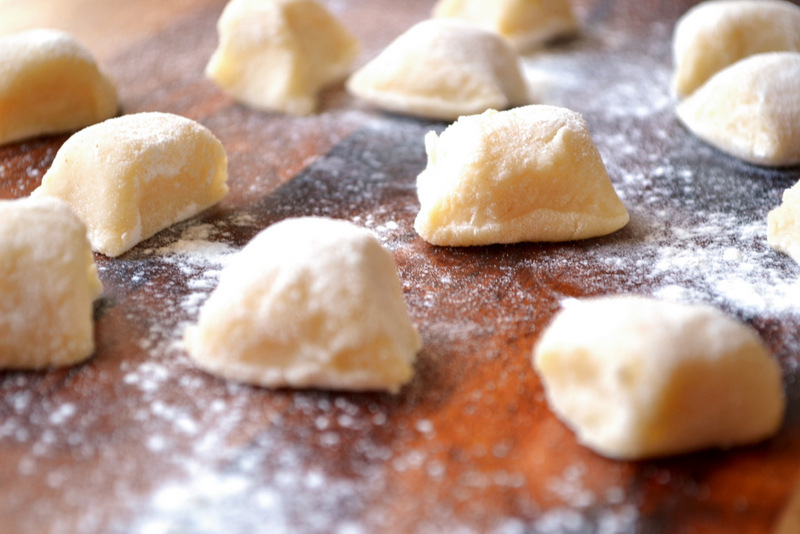 Around since Roman times, gnocchi – pronounced NOK-EE, or NYOK-EE – has been a staple on “the Boot” (lo Stivale) for over 2,000 years, in one form or another. Though there are regional variations, the most popular rendition of these fluffy little pillows is made with potato, flour and egg. Oh and a generous pinch of salt. But despite their rustic simplicity – and the fact they’re very quick to make – I still see so many picking them up at the supermarket. This will not do. Shop bought gnocchi bears no resemblance to the stuff you make at home. 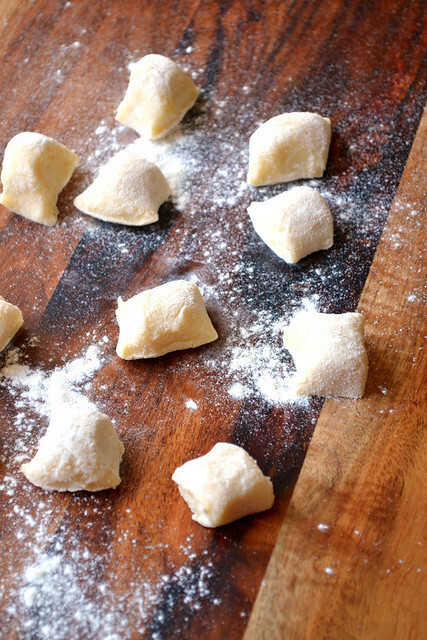 Homemade gnocchi is divine; light, airy, fluffy. A joy to eat. Crack open a packet and you’ll only be disappointed by the stodgy, lumpy specimens within. When it’s a case of boiling, mashing and mixing a few choice spuds with a little flour, egg and salt, why bother visiting the supermarket at all? Serving suggestions for gnocchi are wide and varied. Essentially, you can do as you please with your little dumplings. But if you want my advice, toss them in a generous amount of browned salted butter and serve with a garnish of sage. 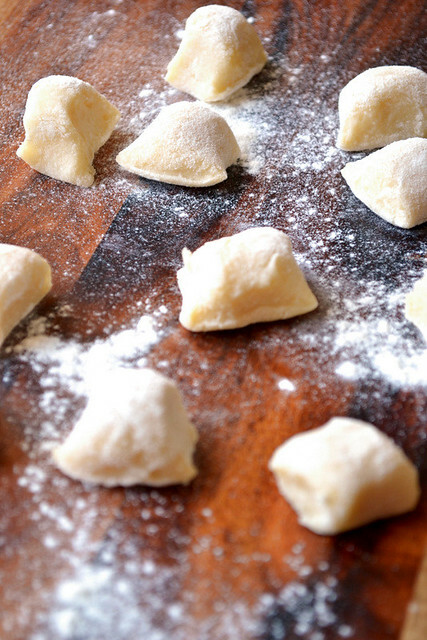 Making gnocchi literally couldn’t be easier. Bring your potatoes to the boil in just enough salted water to cover them. Simmer until cooked and peel with your fingers once they are cool enough to handle. Mash your boiled potatoes and transfer them to a floured surface. Add the remaining flour, save a little, salt and nutmeg to the potatoes and make a well in the centre. Crack in the egg. Use your hands to bring everything together into a soft dough. Don’t knead too much. Re-flour the surface and cut the dough into 5-6 pieces. Roll each piece of dough carefully into a rope shape (2cm in diameter) and cut into 1 inch pieces. Bring a pot of salted water to the boil and add the gnocchi. They are ready when they float to the surface. Using a slotted spoon remove the gnocchi as they rise, draining well before use. Cost: Potatoes, flour and an egg. Gnocchi isn’t expensive. Even in a worst case scenario you’ll pay only £1 for the entire batch. Nick, I have to get my act together and cooke these little pillows of deliciousness. Served with a nice garlic infused pesto and I would be in heaven. You do indeed – pesto is perfect! You actually don’t have to add the egg (the recipe remains the same, although you could add even less flour and make them even more fluffy) and make them even more frugal! Great to hear! It is interesting how in many Italian recipes, less=more. Yes – flavours do tend to carry a long way. Awesome – I hope they go ok! Could you use gluten free flour? I’m not sure – I certainly haven’t tried. But just give it a go – what’s the worst that could happen? I like the fact that you used nutmeg. Beautiful fluffy pillows! What kind of potato do you recommend for these fluffy creations? Russets are probably the best – but failing that, any potato that isn’t too waxy! Thx. I will be making it this weekend, along with your bechamel sauce. Those puffy pillows look like they were made with love! Bookmarked and will prepare in next couple of days…. Thank you. Hi, I’m a single person and would not be able to eat all of these in one go. Once I had dinner with an italian family who made their own pasta and they used to freeze any excess before they cooked it. Would that work with these? I’d love to make my own because, as you say, the shop bought ones fail to impress but fresh made in good italian restaurants are always great. Hi! Personally, I’d just make a half batch or eat on consecutive days. 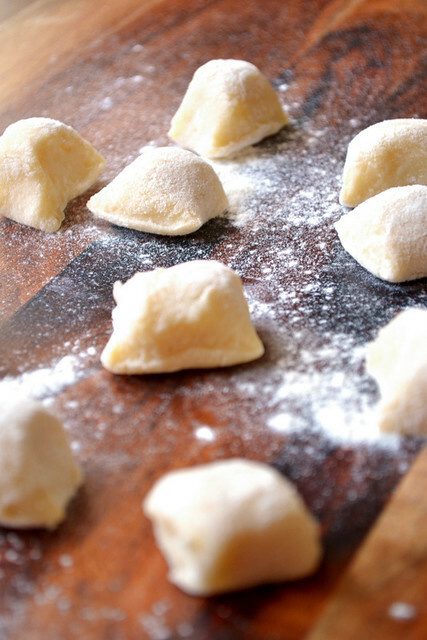 Freezing gnocchi BEFORE cooking would probably be fine, but you may lose some of the quality. Did you give it a go? Totally agree, so easy to make at home – even in Italy I didn’t find good pre-packaged ones! I think the whole idea of pre-packaging gnocchi is wrong!